For geographic and demographic information on the census-designated place Bridgewater, please see the article Bridgewater (CDP), Massachusetts. Bridgewater is a town located in Plymouth County, in the state of Massachusetts, United States. As of the 2010 U.S. Census, the town's population was 26,563. Bridgewater is located approximately 25 miles (40 km) south of Boston and approximately 35 miles east of Providence, Rhode Island. According to the United States Census Bureau, the town has a total area of 28.2 square miles (73 km2), of which 27.5 square miles (71 km2) is land and 0.7 square miles (1.8 km2) (2.62%) is water. Bridgewater is 99th out of the 351 communities in the Commonwealth of Massachusetts, and eighth out of the twenty-seven municipalities in Plymouth County in terms of land area. 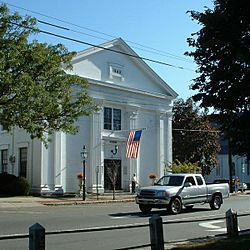 The town is bordered by West Bridgewater to the northwest, East Bridgewater to the northeast, Halifax to the east, Middleborough to the south, and Raynham to the west. Bridgewater is approximately 5 miles south of Brockton, 10 miles northeast of Taunton, and 25 miles south of Boston, of which it is a suburb. Neighborhoods in Bridgewater include Stanley, Scotland Park, Pratt Town, Paper Mill Village, and South Bridgewater. Bridgewater lies along the Taunton River, which has several other rivers and brooks which branch off the main waterway. There are also several ponds, the largest of which is Lake Nippenicket along the western edge of the town. There is a state forest, a town forest, several conservation areas and a large portion of the Hockomock Swamp Wildlife Management Area, in the western part of town. Parts of this swamp give rise to the so-called Bridgewater Triangle, a small area of concentrated reports of strange Fortean phenomena, colonial "dark days", Bigfoot and mysterious black panthers, UFO sightings, and other weird encounters, a phrase coined by Loren Coleman, author of Mysterious America, often compared to the Bermuda Triangle. As of the census of 2000, there were 25,185 people, 7,526 households, and 5,584 families residing in the town. The population density was 916.2 people per square mile (353.7/km²). There were 7,652 housing units at an average density of 278.4 per square mile (107.5/km²). The racial makeup of the town was 87.28% White, 4.04% Black or African American, 2.23% Native American, 1.08% Asian, 0.02% Pacific Islander, 6.23% from other races, and 1.12% from two or more races. Hispanic or Latino of any race were 2.75% of the population. There were 7,526 households out of which 38.6% had children under the age of 18 living with them, 61.5% were married couples living together, 9.5% had a female householder with no husband present, and 25.8% were non-families. 19.6% of all households were made up of individuals and 7.7% had someone living alone who was 65 years of age or older. The average household size was 2.81 and the average family size was 3.27. In the town, the population was spread out with 22.9% under the age of 18, 14.7% from 18 to 24, 32.9% from 25 to 44, 20.9% from 45 to 64, and 8.6% who were 65 years of age or older. The median age was 34 years. For every 100 females there were 110.7 males. For every 100 females age 18 and over, there were 111.9 males. The median income for a household in the town was $65,318, and the median income for a family was $73,953. Males had a median income of $48,438 versus $32,383 for females. The per capita income for the town was $23,105. About 1.9% of families and 3.5% of the population were below the poverty line, including 2.6% of those under age 18 and 6.1% of those age 65 or over. Statistically, Bridgewater is the 71st largest town in the Commonwealth by population, and 110th by population density. In the county, Bridgewater ranks third in population and seventh in density. Bridgewater is the site of the intersection of Interstate 495 and Mass. Route 24, with only a one-mile stretch of the interstate highway running through the southwestern corner of the Town. Just north of this intersection along Mass. Route 24 are two large service areas, both of which have restaurants and a gas station. They are the only two such full service areas along Mass. Route 24, or, for that matter, anywhere along the highways of Southeastern Massachusetts (aside from a stop along U.S. Route 6 in Barnstable; that stop, however, is considered to be off the highway). At the center of town, Mass. Route 18, Mass. Route 28 and Mass. Route 104 meet at the Town Common. Mass. Routes 18 and 28, both north-south routes, are coextensive from this point south to the road's intersection with U.S. Route 44 in Middleborough. Mass. Route 104 passes from east to west, with ramp access to Mass. Route 24 in the west. A short portion of Mass. Route 106 passes along the town line in the northeast of town; Mass. Route 104 's eastern terminus is at that route, just along the East Bridgewater line. The Middleborough-Lakeville line of the Massachusetts Bay Transportation Authority (MBTA) commuter rail passes through the Town, with a stop at the southern end of Bridgewater State University's campus. The stop is just south of the University's main parking lots at the Southern Campus. There is a small air strip in nearby Taunton, and the nearest national air service can be found at T. F. Green Airport outside Providence and at Logan International Airport in Boston. Bridgewater, Massachusetts Facts for Kids. Kiddle Encyclopedia.